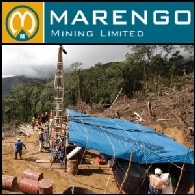 Encounter Resources Ltd (ASX:ENR) is an exploration and resource development company listed on the Australian Stock Exchange. Encounter is one of the most active greenfield exploration companies in Australia. The company is committed to large scale, frontier exploration in highly prospective under cover terrains in Australia where we believe substantial value can be unlocked for our shareholders. In recent times, the company has made new zinc and copper discoveries at our flagship Yeneena project located in the Paterson Province of Western Australia.